Here I go blurring the lines of food definitions again. Is salsa with cheese and avocado really salsa, especially when all I want to do deep down is ditch the chips and eat it with a spoon? I’m gonna stick to my guns on this one, because some recipes are special and shouldn’t be touched. This particular avocado feta salsa recipe was gifted to me by my former coworker Raechell when I first started my accounting career SEVEN years ago. Just a little baby CPA. Even then, in a cubicle, you know I was always talking food and recipes, which somehow prompted the sharing of this summer salsa gem. Not a summer, and sometimes not a winter, even with all its crappy tomatoes, goes by when I don’t make avocado feta salsa. It still gets devoured at any party, followed by rave reviews and so many requests for the recipe. It seems to work really well with sangria or a glass of summery wine, which is maybe why all the comments seem to come from females. Or maybe it’s because we’re the ones who don’t care and will just hover over a bowl of chips and salsa until it’s gone, leaving none for the men. Or because we don’t invite men to our parties for fear they’d eat all the good food. I won’t try to solve that one, but it’s more than apparent that avocado feta salsa is a crowd pleaser. As I prepared a batch for this photo shoot, I tried to analyze what it is that makes this salsa recipe so addictive, and it’s kind of hard to say. First, you can’t beat peak summer tomatoes in any format. For this recipe we’re actually using those firm roma tomatoes, not the fancy heirloom varieties you might be seeing at every farmers market and natural food store this time of year. If you’re a seasoned salsa maker, you know that romas hold up much better to the rigors of the process, like stirring (so rigorous) and acidic ingredients. 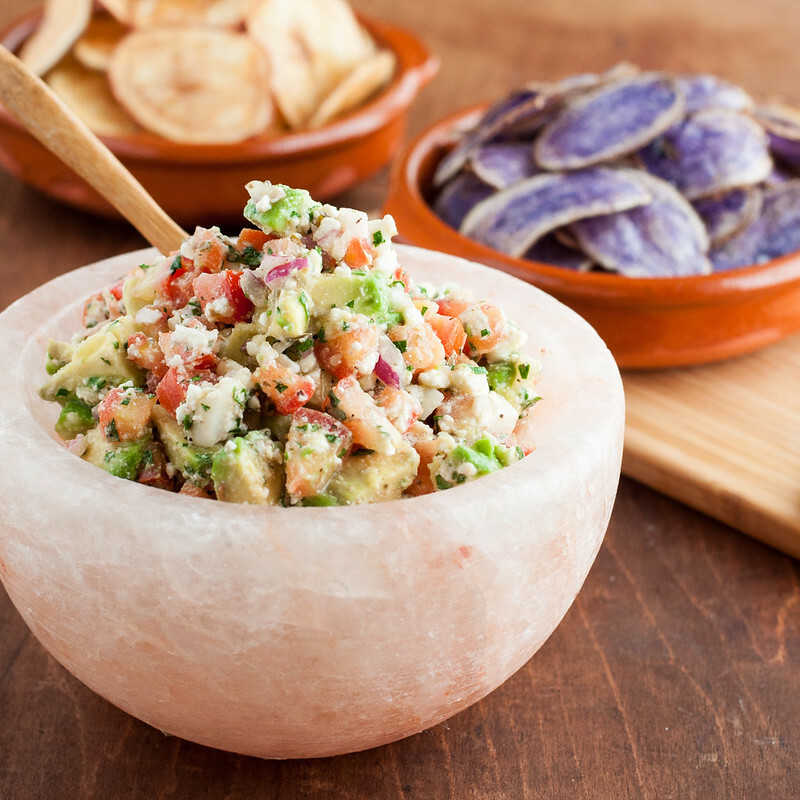 Next, avocados add their distinct color and rich texture to the salsa. Instead of mashing them up as you would in guacamole, they’re left in cubes and folded in last to help them stay intact. Just beware of diggers. You know, the ones using their chip as a surgical tool to root through the community bowl of salsa and pick out the avocado chunks. We’re onto you diggers. Knock it off before I revoke your dipping privileges. 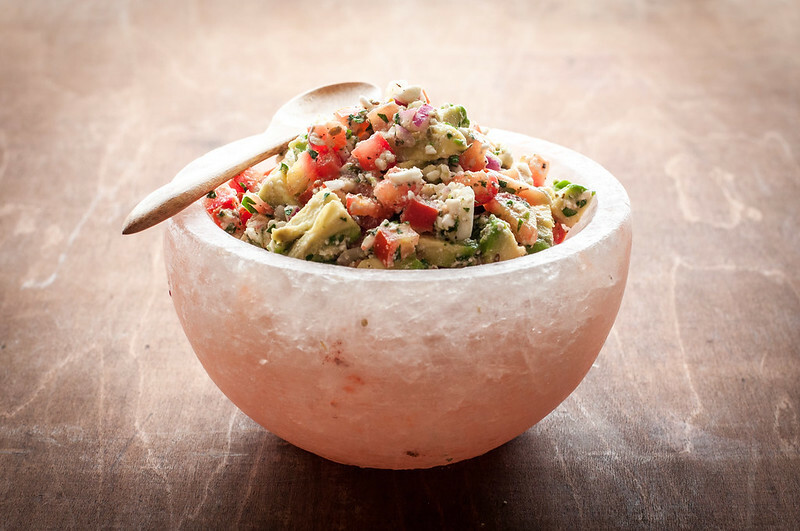 Finally, and I saved the best for last, crumbles of sharp, salty feta put the figurative cherry on top of this avocado feta salsa. Hence the namesake? You might wonder, like I used to, why we have to let this sit in the fridge for two hours before serving. Well, honestly, you don’t have to, but have you ever tried marinated feta? I did for the first time last week, and now I understand the true magical workings of this salsa. As it sits in the fridge, bright vinegar, your best olive oil, fresh summer herbs, and plenty of black pepper work their way into the cheese, so each crumble becomes this huge burst of flavor when you finally take a bite. Sounds a bit dramatic for a little bowl of salsa, but that’s the only description that does justice to the final product. I’ve had so much fun hosting this bi-weekly group that I plan to offer it as a live service via my personal chef business. That poses a problem for most of you who aren’t within driving distance, though. I wanted to ask if you need to spice up your ladies (or guys) night in, because I might put together a resource–either web-based or in PDF–with all the plans you need to host your own dinner making party! If that sounds like fun, leave me a comment down below. You could always alter the plans to your needs, but mine would focus on a group of about 8 and include menus and printables, plus guidance on how to coordinate and prepare for the evening. 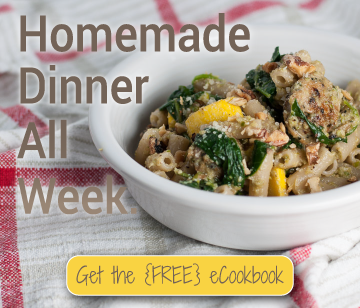 This summer our menus have focused on easy or stovetop meals, so aside from sharing delicious food, we actually come away with new weeknight dinner recipes. One last note on the salsa. I’ve served it with tortilla chips, and the scoop shaped ones are especially great for getting a big bite of salsa every time. 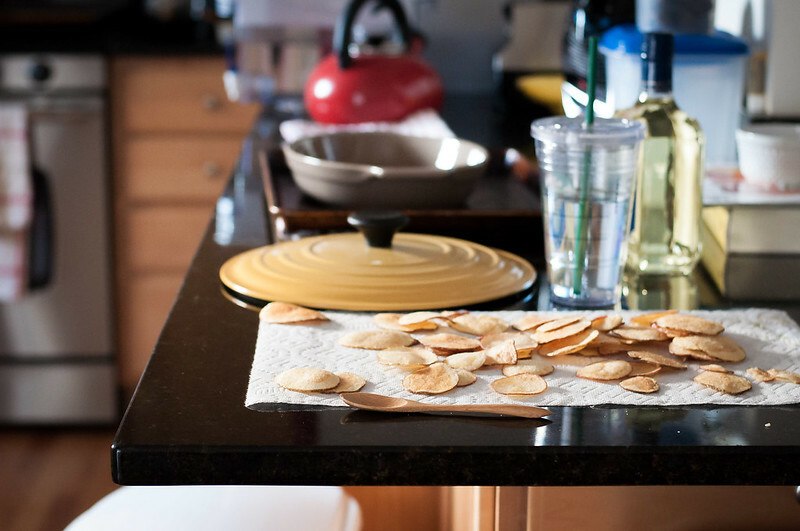 This time, I planned to include a recipe for the homemade blue (and regular) potato chips you see here, but it was honestly a TON of work and a huge use of oil, when there are a lot of totally decent potato and vegetable chips you can just go buy at the store. 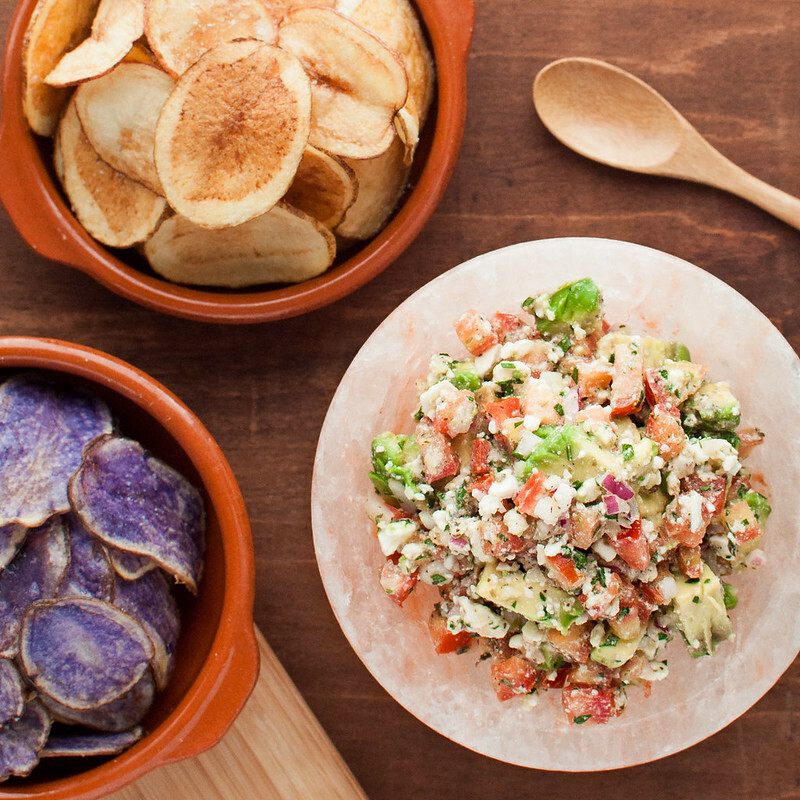 I love the color contrast of the blue chips with the salsa, but any potato chip will do. Another option is pita chips, and yet another is pre-portioning the salsa onto bruschetta toasts for a fancier appetizer. If you do want to spend 4 hours preparing and making your own chips, the method I used most closely resembles the Pioneer Woman’s method. Despite rave reviews wherever you take this salsa, you'll want to keep the recipe a secret when you realize how simple it actually is! A few fresh, seasonal ingredients combine into one sophisticated, addictive party appetizer. Combine onion, garlic, vinegar, a pinch of salt, and pepper to taste in a medium bowl. Let rest while you prepare remaining ingredients. Add tomatoes, herbs, and olive oil and stir gently to combine. Fold in avocado, lemon juice, and feta and adjust seasoning as needed. Cover surface of salsa with plastic wrap and refrigerate for 2 hours, or up to a day, before serving. The recipe is vegetarian (if using vegetarian feta) and gluten-free. 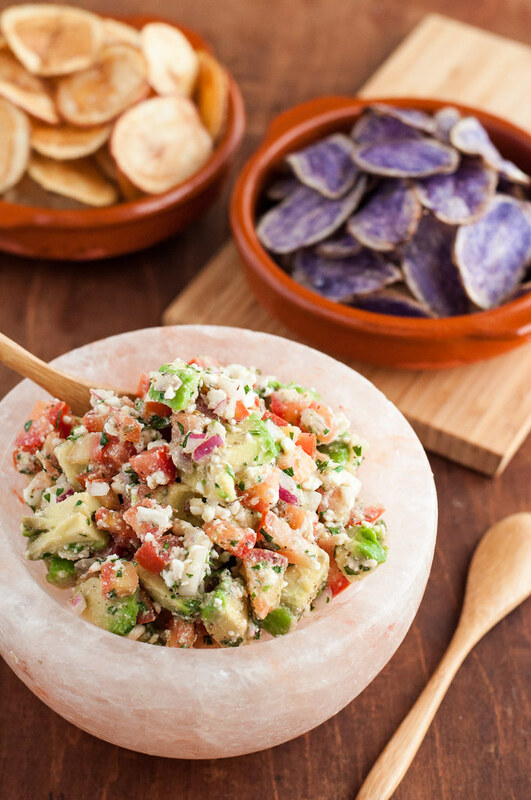 For gluten allergies, do not use pre-crumbled feta: most brands contain a powdery coating with gluten to keep the crumbles from sticking together. The block kind tastes much better, too! Note: This page contains affiliate links. It does NOT contain sponsored content. Affiliate links (to products I recommend, on Amazon) offset my ingredient and website maintenance costs, so I can keep bringing you party recipes like this one. Thanks! I love this recipe, I can definitely imagine the taste. 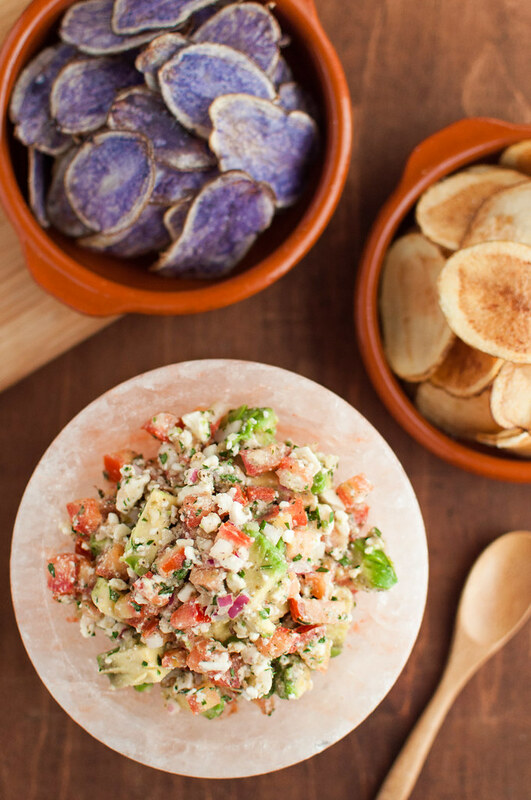 What amazes me is that there is such a thing like precrumbled feta. Why? It takes like 5 seconds to crumble a large piece with the hand. Last time I prepared this recipe I got many compliments from my friends!